Billy Graham is one of those rare individuals who has become a legend in his own lifetime. Recognized as the world's most famous evangelist, he has preached to more people than anyone in the history of religion. Billy Graham's influence, however, reaches far beyond the pulpit as he has become a worldwide crusader for religion, a spokesman for political and social change, and a sublimely successful businessman and fundraiser. The wisdom and guidance he has offered the world are captured in Billy Graham Speaks, a unique portrait of the reverend in his own words-culled from sermons, newscasts, articles, and interviews. Graham talks about everything from marriage, children, and faith, to religious tolerance, leadership, and integrity, to popes, presidents, and ordinary people. He reflects on his life as an evangelist who has traveled the world and witnessed some of this century's milestone events, including the advent of racial integration in the South, the fall of Communism, and the social and political struggles in Northern Ireland and South Africa. He looks within to confront his own feelings of self-doubt and discuss his undying belief in God that has been central to his life for more than three quarters of a century. * "All over the world, whenever I meet people face to face, I am made aware of this personal need among the famous and successful as well as the lonely and obscure." * "I'm looking forward to death. I'll be very happy to get out of this body and into the world that's being prepared." * "As long as there is a soul to be won by Christ, I'm under orders by the Lord to go try to win that soul to Christ." * "If anything bothers me, it is the thought that at Judgment Day I may find that I have not been as faithful as some other minister who is slugging it out day after day with few visible achievements . . ."
The world listens when BILLY GRAHAM speaks "The more the archeologist digs and the more the scientist discovers, the greater the confirmation of the truth of the Bible." "Billions and billions of stars are out there, and behind them all is God." "It's going to be quite a revealing thing at the Last Judgment when we see everyone standing naked before God." "I am only a Western Union messenger boy, delivering a telegram from God to the door of humanity." 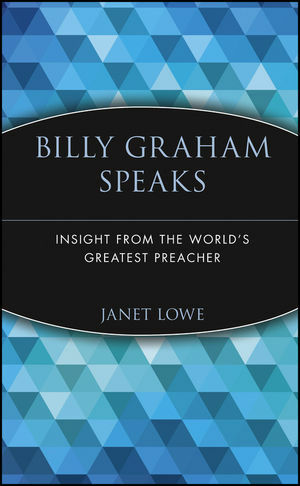 Like other Speaks books, Billy Graham Speaks was created through the independent research of the author Janet Lowe. It has not been authorized by its subject. JANET LOWE's previous books include Warren Buffett Speaks, Jack Welch Speaks, Bill Gates Speaks, and Oprah Winfrey Speaks (all published by Wiley). Her hundreds of articles have appeared in such publications as Newsweek, the Christian Science Monitor, the Los Angeles Times, and the San Francisco Chronicle. Ms. Lowe lives in Del Mar, California, with her husband, Austin Lynas. Billy Graham's Vision of Christianity. Billy Graham and Earthly Issues. Looking Back on a Long Life. List of Crusades, 1947 to 1999.